After graduation, Alicia moved to Roseville, CA. and began working for Hewlett Packard. While employed at Hewlett Packard, Alicia concurrently pursued a master’s degree in Mechanical Engineering at Stanford University, graduating in 2000. During her tenure, she discovered the sport of Ultimate Frisbee, winning a College National Championship with Stanford in 1999. She continued to play at the Club level, ultimately winning 7 National Titles and 2 World Titles, as well as coaching the UC Davis women’s team to a National Championship in 2004. After an eight–year career at Hewlett Packard, Alicia and her husband Andy decided to throw caution to the wind. They quit their jobs, sold their house, and moved to Truckee – a mountain town that mirrored the small town feeling and sense of community of Chico. They started a family business named FiftyFifty Brewing Co., which has earned multiple national and international awards and accolades. Two years after the founding of FiftyFifty, they opened a second business, Drunken Monkey Sushi. Most recently, they have gone into the development business with the purchase of a parcel of land on the Truckee River, where they will be embarking on a river restoration project as well as a multi–use development venture. Alicia continued to stay active with her alma mater, CSUC, serving on the College of Engineering Advisory Board, as well as the Alumni Association Board of Directors, including 2 years as President. She is also very active in their Truckee community, serving on the Truckee Tourism committee and as a volunteer for the Meals on Wheels program with Sierra Senior Services. 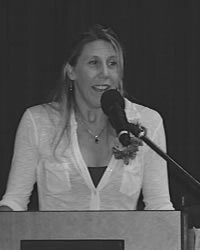 In 2013, Alicia was elected to serve on the Truckee Town council, and was most recently appointed as Vice Mayor. Through FiftyFifty, Alicia and Andy have also partnered with a number of local non–profits, including the Truckee River Watershed Council, Humane Society Truckee–Tahoe, High Fives Foundation, and The Gene Upshaw Memorial Tahoe Forest Cancer Center.